3D printing has emerged significantly with broader applications areas especially in the healthcare sector. 3D printed customized medical devices, such as hearing aids, dental implants and prosthetics, have become quite successful. Bioprinting which is a subset of 3D printing works on the same principal of 3D printing except the procedure is performed using living cells, tissues, and organs, where the complexities of tissues and cells, such as cell types, functionalities, growth, and differentiation patterns, are addressed. It is the artificial construction of living tissues through placing layer upon layer of living cells. It is a variant of biomedical application of rapid prototyping technology or layer by layer additive bio-fabrication of 3D tissue and organ constructs for the replacement, repair, and regeneration of damaged and diseased human organs and tissues. Although, bioprinters come in various configurations, the basic process is the same. All machines extract an adequate number of cells, which comes from a bio print head in order to build up a three-dimensional organic object. Most of the bioprinters extract a dissolvable gel (as a scaffold) to protect and support cells during printing. The advent of 3D bioprinting technologies has led to significant progress in the manufacturing of large bioartificial organs, such as bones, livers, hearts, cartilages, and skins. It can produce living tissues, blood vessels, and potentially whole organs for its usage in medical procedures, drug discovery & testing, tissue engineering research & study, and others. The advantages of 3D bioprinting over other fabrication techniques are: it enables fabrication of anatomically correct shapes, allows fabrication of porous structures, can co –culture multiple cell types locally, and control the delivery of growth factors and genes, as well as can generate tissue models in high-throughput manner and integrate vascularization. The widening gap between the demand and the supply of organ transplants represent a huge unmet need amongst the patients and doctors. The emerging bioprinting technologies has a strong potential in filling this gap. The eventual goal of researchers is to be able to produce bio printed organs for organ implants. The market is expected to progress gradually over the coming years with the focus of shifting from research to commercialization. The early success of the bio-printed organ transplants is likely to provide additional boost in the subsequent years. This research study includes an extensive analysis of the global bioprinting market by product, application, technology and geographical region, allowing the researcher to develop a comprehensive outlook of the market. Each of these segments has been analyzed based on their current and future market size, considering the macro and micro environmental factors. The market report presents a detailed and investigative study of the entire market and provides a comprehensive insight into various forms of development, trends, and the key market participants. 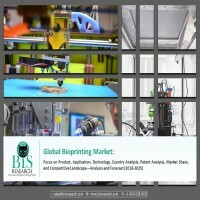 While highlighting the key driving and restraining forces for this dynamic market, the report also provides a comprehensive section on competitive landscape, market share analysis, competitive benchmarking, and the position of the competitors within the global bioprinting market. • How did the market share of the leading companies change in 2016, and which country will lead the market in 2017? • What will be the growth rate of different segments during the forecast period? Which is the leading segment by product, application, technology and region? The key players who have significant contributions to the bioprinting market are Organovo Holdings Inc., Aspect Biosystems, Advanced Solutions Inc. (Life Sciences), Allevi (BioBots), 3Dynamics Systems, Cellink, Cyfuse Biomedical K.K., RegenHU, Regenovo Biotechnology Co. Ltd., and Poietis, among others. 9.24 Sichuan Revotek Co. Ltd.
10 Overview: Aspect Biosystems Ltd.
15 Overview: 3Dynamic Systems Ltd.
21 Overview: Organovo Holdings Inc.
27 Overview: Regenovo Biotechnology Co. Ltd.
34 Overview: Cyfuse Biomedical K.K. 39 Overview: Sichuan Revotek Co. Ltd. The 3D printing market has continuously evolved in the past three years, proving to be one of the most promising industries to look up to in terms of investment. Suitable for today’s technological and commercial areas, the 3D is the process used to produce three-dimensional objects. 3D printing is a well-known concept having advanced ability to use digital instructions (software guidance) to manufacture specific shapes using ceramics, plastics, polymers, metal alloys, and other materials. The 3D printing industry has experienced a rapid growth rate in the past few years due to its diverse applications. Active support of government and industry players in increasing the awareness regarding the benefits of using 3D printing over conventional methods of manufacturing serves as a strong factor attributed to the growth of the global 3D printing market. Moreover, the ongoing technological advancements, such as incorporation of new materials and surface enhancement of the final model, ease in the development of customized products, reduction in manufacturing cost, and government investments in 3D printing projects are some of the other favorable factors for the growth of the 3D printing market. With the advancement in modern science and technology, organ failure or deterioration caused by the acute/chronic diseases, congenita malformations, and traffic accidents have become the most prominent social problems. As per the Journal of Chinese Medical Ethics, there are around 1.5 million patients who require organ transplantations in China every year, but only less than 1% of patients can obtain suitable organs. As compared to the traditional artificial organs made up of polymers or metals, the bioartificial organs are made up of living cells and biomaterials. A wide variety bioprinting strategies have been developed to tackle the challenges for the manufacturing of bioartificial organs with physiological functions. The objective of these strategies is to build complex organ geometries through a spatiotemporal pattern of heterogenous types of bio-inks, especially cells. Developments in 3D bioprinting technologies have made possible printing of bioartificial organs, such as heart, liver, bones, cartilages, and skin. Using 3D bioprinting technologies in living tissues, blood vessels and whole organs can be developed for use in medical procedures, drug discovery & drug trials, tissue engineering research and other medical and biomedical applications. Advantages of 3D bioprinting, when compared with other tissue fabrication techniques, include, fabrication of anatomically correct shapes, fabrication of porous structures, co-culture of multiple cell types locally, controlled delivery of growth factors and genes, high-throughput tissue model generation and enabling vascularization of the tissues. There is a huge gap between the demand and the supply of organs for transplantation. The 3D bioprinting technology has the potential to bridge this gap soon. Extensive research is underway to develop complete bio printed organs for transplantation purpose. The market for bio-printed organs will develop gradually over the coming years as the 3D bioprinting technology matures and moves out of laboratories towards commercialization. The initial success of bio printed organ transplants will likely provide the additional boost to the market in coming years. Growing demand for organ transplantation, rise in public & private funding to support 3D bioprinting research activities, increasing usage of 3D bioprinting in drug discovery process, increasing geriatric population, and active participation of the government and the industry players in the technological advancement in the field of 3D bio printing are the factors have boosted the overall growth of this market. Although the scientists and researchers are still working to print 3D functional human organs, 3D bioprinting already has numerous applications in toxicity testing, tissue engineering, drug discovery, consumer product testing, bone transplants, and cosmetic dentistry. Moreover, the creation of living organs and human tissue could be potentially used to replace the traditional in vivo practice been performed for the testing of drugs for various therapeutics. However, the shortage of skilled professionals to understand the complexity of life sciences and cellular biology, the high cost of bioprinting platform and lack of regulatory guidelines governing the 3D bioprinting serve as a restraint for the growth of this market. The industry players are trying hard to get regulatory approvals for their tissue models and organs to be used directly within the human bodies. The product segment of the market comprises of bioprinters, consumables, software, services, and others (models and molds, among others). The bioprinters acquired the highest market value in 2016, growing at the CAGR of 13.8% during the forecast period 2018-2025. However, software solutions are growing at the highest CAGR of 18.4%. The application segment of the market comprises of research application (3D cell culture, regenerative medicine, and drug research, among others), clinical applications (dental, orthopedic, skin substitutes & grafts, and vascular tissues & organs, among others), and other applications (tools, prototypes, and molds). The research applications constituted the highest market value in 2016, growing at the CAGR of 11.9% during the forecast period 2018-2025. However, clinical application is expected to grow at the highest CAGR of 19.4% during to the forecast period 2018-2025. The technology segment comprises of extrusion based, inkjet-based, magnetic levitation, and photocuring technology, among others. The extrusion-based technology accounted for the highest market value in 2016 which is anticipated to reach $2.59 billion by 2025. However, the magnetic levitation is expected to grow at the highest CAGR of 19.6% during the forecast period 2018-2025. North America generated the highest market value in 2016, growing at the CAGR of 14.4%. However, Latin America, (comprising Brazil and Mexico, among others) is expected to grow at the highest CAGR of 16.8% during the forecast period 2018-2025, followed by the Asia Pacific. Advancements in 3D bioprinting technologies coupled with the high demand for organs and tissues, government initiatives & rising investments for R&D, customization of products and competitive advantages are some of the key drivers that boost the growth of the bio-printer market globally. A wide variety of 3D bioprinters have been developed in the recent years and are still being developed from high cost to low-cost, many of them are yet to be launched in the market.